Reread, so no rating. Still one of my favorites from the series. Last year I started re-reading the Harry Potter series. I grew up reading these books and this one has always been my favorite. There is something about believing all your troubles are history and that you'll finally have a place in the world to only have your hope dashed to bits. It's so real. Harry experiences that every school year to some degree when he has to leave to his family's for summer breaks, but he doesn't ever experience it as much as he does in book 3. He is so happy to finally have a piece of his parents, to have an adult that is his guardian who loves him, really loves him and it is all taken away because of the cowardice of one man, one rat. It's truly heartbreaking. Also heartbreaking, are the actions of the author of this series. She is a TERF (Trans-Exclusionary-Radical-Feminist) and her writings indicate a gross misunderstanding of Native cultures as she writes about them as they are all one. These are troubling and disappointing attributes. I hope to see these attitudes change, but I am not holding my breath. I am going to continue to re-read the series, but now I will read it through a more critical lens. In Harry Potter and The Prisoner of Azkaban, Harry Potter is going to school, but the murderer Sirius Black is after him. People say that he murdered 13 people with one curse and that he is loyal to Voldemort. He was kept in the prison that is called Azkaban (it is very bad there), but he has escaped and he might be going after Harry Potter because Harry Potter stopped lord Voldemort. The guards at Azkaban heard him muttering in his sleep, “He’s at Hogwarts, he’s at Hogwarts.” Harry is not safe at his school because there might be a traitor inside the walls of Hogwarts. I like this book because it is thrilling, suspenseful, and keeps you guessing. I would recommend this book to teenagers because it is scary and action packed. This book is where the series first starts to transform from an enjoyable, playful flight of whimsy to something more serious. I love Sirius Black, and this is the first book where you meet him. Book Description For twelve long years, the dread fortress of Azkaban held an infamous prisoner named Sirius Black. Convicted of killing thirteen people with a single curse, he was said to be the heir apparent to the Dark Lord, Voldemort. Now he has escaped, leaving only two clues as to where he might be headed: Harry Potter's defeat of You-Know-Who was Black's downfall as well. And the Azkban guards heard Black muttering in his sleep, "He's at Hogwarts...he's at Hogwarts." Harry Potter isn't safe, not even within the walls of his magical school, surrounded by his friends. Because on top of it all, there may well be a traitor in their midst. Editorial Reviews Amazon.com Review For most children, summer vacation is something to look forward to. But not for our 13-year-old hero, who's forced to spend his summers with an aunt, uncle, and cousin who detest him. The third book in J.K. Rowling's Harry Potter series catapults into action when the young wizard "accidentally" causes the Dursleys' dreadful visitor Aunt Marge to inflate like a monstrous balloon and drift up to the ceiling. Fearing punishment from Aunt Petunia and Uncle Vernon (and from officials at Hogwarts School of Witchcraft and Wizardry who strictly forbid students to cast spells in the nonmagic world of Muggles), Harry lunges out into the darkness with his heavy trunk and his owl Hedwig. As it turns out, Harry isn't punished at all for his errant wizardry. Instead he is mysteriously rescued from his Muggle neighborhood and whisked off in a triple-decker, violently purple bus to spend the remaining weeks of summer in a friendly inn called the Leaky Cauldron. What Harry has to face as he begins his third year at Hogwarts explains why the officials let him off easily. It seems that Sirius Black--an escaped convict from the prison of Azkaban--is on the loose. Not only that, but he's after Harry Potter. But why? And why do the Dementors, the guards hired to protect him, chill Harry's very heart when others are unaffected? Once again, Rowling has created a mystery that will have children and adults cheering, not to mention standing in line for her next book. Fortunately, there are four more in the works. (Ages 9 and older) --Karin Snelson --This text refers to the Hardcover edition. 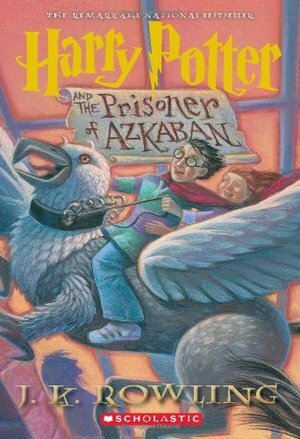 From Publishers Weekly In this third installment in the projected seven-volume series, Sirius Black, imprisoned for killing 13 people with one curse, escapes from Azkaban. As he heads for Hogwarts, the chilling Dementors who trail him quickly descend upon the school. "Each successive volume expands upon its predecessor with dizzyingly well-planned plots and inventive surprises," said PW in a Best Books of 2001 citation. Ages 8-up. Copyright 2001 Cahners Business Information, Inc. I rated my book 5 stars because it was exciting, scary, and interesting. This book is about a boy who is a wizard and figures out that an old friend of his dad [who died] is wanted but figures out he is really his godfather. My favorite part is when he figures out that the friend of his dad is his godfather. This book is Perfecto Patrunum!